Learn how to add a start time and estimated times to a stripboard. You're on set, and need an easy way to track when you will start shooting, and how long it will take to shoot a scene. We make it simple to add times to your stripboard. This is important to make sure you stay on schedule, and avoid any timing hiccups. Enter an estimated time or start time for the scene. Note: Make sure you select Est. Time or Start Time from Adjust Columns in order to have it visible in the shooting schedule. What are the time calculations based on? Currently, the call time calculations are based on fractions, and not to be confused with minutes. For example, adding ".30" is actually "30%" of one-hour. This means that 30% of 60 (minutes) would be 18-minutes, which is what it would calculate it as. What does Est. (H) and Prep (H) stand for? 'Est. (H)' stands for the total estimated time that a scene would take to cover on your Shooting Schedule page. 'Prep (H)' stands for what the prep time would be for a specific scene on your stripboard. If you've added a Day Break, you'll notice "Total Estimated Time" is added, which will automatically calculate the Prep and Shoot hours. Can I edit times on a call sheet? You can edit both start time and Est. time on the call sheet making it a breeze to make changes quickly without having to start over. Will I be able to view estimated times on the reports? Yes, estimated times will show up on the shooting schedule report, and the breakdown summary report, making it easy for you to see how long scenes take. How do I change the time format for scenes? Currently, there is no way to change the time format for the estimated time column (from hours to minutes). 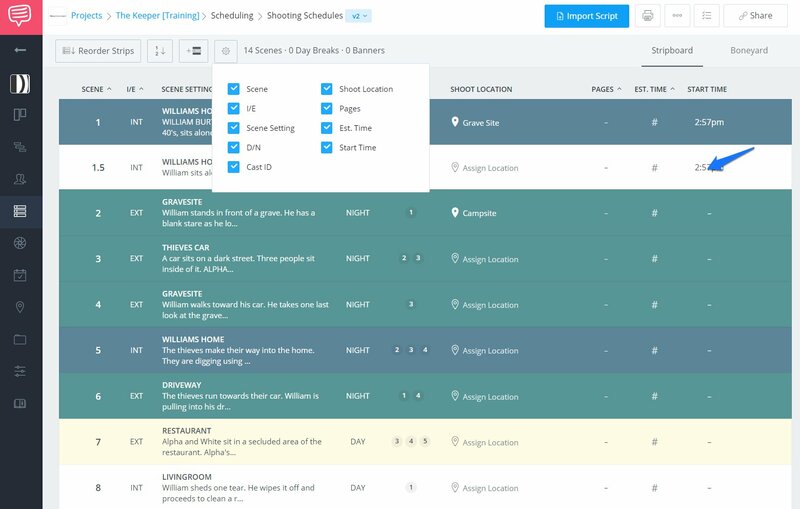 Best Practices when adding times to a shooting schedule. To avoid running late, be realistic with the time. In addition to shooting time, you will need to allow plenty of time to setup the equipment. Pro Tip: You can also enter a time for each shot in the shot list. Learn how to create and send call sheets.